More and more, the face of an auto parts worker is that of a low-wage worker, often a worker of color who is laboring under unsafe conditions and being denied his or her legal right to organize a union. At Ground Effects, a Ford supplier in the Detroit suburb of Dearborn, 100 workers are working around hazardous chemicals with inadequate ventilation. Many believe they need a union to fight for on-the-job safety and better wages. After losing a representation election, conducted by the National Labor Relations Board, by one vote, United Auto Workers supporters filed charges with the NLRB accusing the company of intimidation. Ground Effects management had threatened to move the plant if the UAW won. The NLRB agreed with the workers and ordered the company to schedule a new election and to pay back wages to 16 union supporters who were sent home early without pay. However, two of the 16, John Salazar and Maria Sanchez, were subsequently fired. 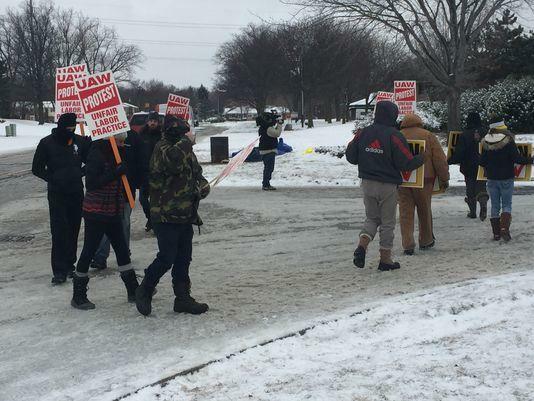 On March 3, the UAW held informational picketing outside the factory, carrying signs that read, “Stop poisoning us.” Workers have suffered from skin rashes, hair loss and asthma, which they attribute to the isocyanate chemicals they work with. In addition to filing the NLRB charges, workers have filed 10 charges with the Michigan Occupational Safety and Health Administration. The picketing began at 3 a.m. and some truck drivers refused to cross the line. The workers will continue the struggle until they get union recognition, a signed contract, decent wages, job security and safe working conditions.